Vikki Laing and Scott Henry went into the final rounds of weather hampered golf events with excellent chances to win their respective titles. Laing was a shot behind Czech teenager Klara Spilkova in the Turkish Airlines Ladies Open. 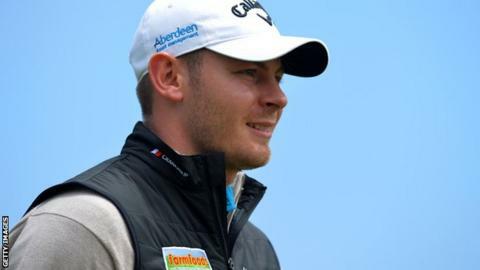 Fellow Scot Henry remains the clubhouse leader at the Madeira Islands Open after the European Tour event was reduced to 36 holes. Henry shot a five-under-par 67 on the opening day. Since then, a number of players have been unable to even finish their first rounds because of fog. No play was possible on Thursday and more delays on Friday meant the tournament had already been cut to three rounds. A further reduction to 36 holes was then announced following another suspension of play on Saturday morning, with tournament officials willing to sanction a Monday finish to complete two rounds. After play was suspended for the day, it was announced that a cut to the top 65 players and ties would take place after the first round had been completed on Sunday. Henry holds a one-shot lead over English pair Daniel Brooks and Lloyd Kennedy, who both returned rounds of 68, with Spain's Antonio Hortal also four under with two holes to play. England's Andrew Marshall, Austria's Martin Wiegele, Spain's Pedro Oriol and France's Julien Guerrier are another stroke back after rounds of 69. Friday's play was washed out at the women's event at the National Golf Club in Antalya, where Laing started her final round on Sunday on six-under par, with compatriot and first-round leader Heather MacRae three strokes behind. A bogey on the ninth, her final hole, cost Laing a share of the lead after she made a brilliant start with three birdies and an eagle in her first five holes, the 33-year-old eventually signing for a four-under-par 69. "I'm super happy with it," Laing said. "I got off to a really fast start and made a bunch of birdies at the beginning. I hit the ball well and made a few good putts. "I'm hitting it well and I'm rolling the ball well on the greens, so it's a good combination. "I'm just trying to hit fairways and greens."